Interviewer: And everybody married somebody Jewish? Interviewer: Everybody. And would they help each other out financially when needed? Interviewer: It was that kind of family. Melvin: And it was required. Melvin: Yeah, in other words there were hardship cases all the time. Interviewer: And we supported the family? Interviewer: All right, so, your mom and dad met somehow or another. When was their wedding? Melvin: It was a sad wedding. Because – they would have been married – They were actually married August 27, 1911, a year before I was born. My mother’s father had died that week. So it was a small wedding. My mother always spoke of it with tears in her eyes. Interviewer: Thinking of her dad. But you don’t change wedding dates. Interviewer: That’s the truth isn’t it. Melvin: And my mother was so adoring, fond of her father, she never stopped talking about him. Interviewer: That’s good. All right, so they were married. Did they move to their own home when they first married? Melvin: Yes. Somewhere in the back of my mind they may have been in Chicago for a year. I don’t know. There may have been a little traveling, and I’m so vague on it we ought to really skip it. But basically they lived in St. Louis. They started out maybe a three room flat somewhere in the West End of St. Louis on the North side. And developed from there but always stayed in North St. Louis. From there I know they had a store on Newstead and Lee, and lived upstairs in a flat above the store. Interviewer: Are you born at that moment – in this story, I mean the Newstead and Lee time. Melvin: Yes. I think I was alive on Page. Interviewer: So, they never moved far? Melvin: No, I was probably born a year after they were married. Interviewer: Yeah, you were. Alright, so, he is prospering. Melvin: He’s doing alright. Just getting by. Interviewer: Does his wife work? Melvin: She would sit with him and sew? Interviewer: So she helped out? Melvin: Oh, she would baste, and sew, and mend. In later years when my father had sort of quit tailoring, and things were very bad, in the Depression years he had a cleaning shop, my mother would even press on a pressing machine. Melvin: Oh, yes. My mother worked hard all her life. Interviewer: So he had to give up his tailoring business? Melvin: Yeah. The factories had then started. You could buy suits for 22 dollars and fifty cents. Melvin: Yeah. And it became a whole new way of life, you know. The tailoring business was disappearing. Only the very affluent could afford tailor-made clothes. Interviewer: And some of those got poorer in the Depression anyway. Interviewer: Alright. So he then opened up a cleaning shop? Interviewer: You mean you picked up a lot and moved. Melvin: Well, never far. All over West St. Louis. I know I can think of three or four addresses around Newstead and Clara. Melvin: We lived on, what’s the first street immediately North of Delmar. Melvin: Enright. No, Enright is a cross street. A parallel street to Delmar. Interviewer: Enright goes the same as Delmar. Melvin: Does it? That wasn’t the street we lived on. What’s the next one? Melvin: We weren’t that far from it, between Cabanne and Delmar there are some streets. We lived in several apartments in that area, and then we moved over to Westminster, to another street closer to the university. I know when I went to college we lived. Melvin: Yeah, on a street – I wish I could think of it, and I see the owners of that property all the time. Interviewer: Alright. Now let’s discuss your growing up. What was your early life like? Melvin: That’s a hard question to answer because I’m not too sure I know what you are asking me about. Melvin: My father’s love of reading certainly impressed me, and I knew I was to go to school, I was born to go to college, and there was never any way out of it. Interviewer: That was a teaching in the family. Melvin: That’s right. It was accepted. And I did. Interviewer: How did he make it possible? Melvin: When I started college, tuition was $125 a semester, $250 a year. We had a hard time raising it. Interviewer: They didn’t have scholarships in those days? Melvin: They did. I think I went to school for a time on a half scholarship. I wasn’t a real shining bright student. I was a decent student. I think the best I ever had was a half scholarship. Interviewer: Alright, let’s go back to grade school. Where was your school? Interviewer: A neighborhood school? You walked? With friends? Melvin: Or neighbors. It was maybe 3 or 4 blocks from where I lived. I lived at let’s say Newstead and Lee, and the school – Ashland school was on Newstead, maybe four blocks away, I’m not sure which direction. I would walk to school every day. I think we were the only Jewish family in that neighborhood. It was an Irish Catholic neighborhood. I think I got beat up once in a while. Interviewer: Were you big enough to stand it? Melvin: I got hurt sometimes. On the other hand I had some very good friends who would protect me. Interviewer: Was it unusual for your parents not to have stayed in a Jewish neighborhood? Melvin: No, because in those days you stayed where your store was. If your business couldn’t be in a Jewish neighborhood, you had to be where the customers were. Melvin: That was one of … so that wasn’t unusual. Although there were a lot of people who were not trades people who lived at that time around Eastland avenue and Clara. We were never a part of that crowd. Interviewer: Alright, so how close in age are Harold and Mandell? Melvin: A sad story. Mandell is ten years younger than I am. Mandell is not living, he was killed in the war. My mother never got over it. Melvin: World War II. I still feel…I was very fond of my brother. He was a wonderful kid. Interviewer: How much younger is Harold? Interviewer: So you were closer? Melvin: We were both very close to Mandell, who was our little son. Each of us felt paternal towards him. He was a great kid. Interviewer: Alright, so your mom helped in the shop? Interviewer: And, but generally took care of you kids? Interviewer: And did you do any afterschool activities? Melvin: I guess I worked at everything a kid could possibly work at. I don’t believe any kid has had more different jobs than I had. Melvin: I did the usual thing like working at a drugstore and soda fountain. Melvin: Oh, sure, and I probably worked at three or four different drugstores. And working on Saturdays at grocery stores, meat markets downtown, at Rembly’s (?) I remember. There were several stores downtown I worked on Saturday when I was already, the last few years of grade school and all through high school I worked. Melvin: Oh yes, I think I did that, but I usually did something better than that. Interviewer: Yeah, alright, were there after school athletics ever? Melvin: I never partook of athletics. I was not athletically inclined. Interviewer: Not even neighborhood baseball games? Melvin: To this day I don’t. Interviewer: What about music in your family? Melvin: We’re not musically inclined. They tried to get me to play the piano, and I think I took two lessons, and I realized it was hopeless. Interviewer: But did the other boys? Melvin: No, our family just is not musically inclined. 1) Barney Newmark and Bertha Cruvant were married on August 27, 1911. Bertha's father, Moshe Leyb, died one month later on September 26, 1911. However, according to the physician's statement on his death certificate, the physician first 'saw' him on August 20th. He died of liver cancer, and since he only lived a month, it was likely pretty far developed. I suspect he was hospitalized, or at least bedridden during his daughter's wedding. 2) According to the city directories, they lived on Page avenue in 1912, and Plymouth avenue in 1913. Since my grandfather was born in August of 1912, whether or not he was alive for Page depends upon moving date. I need to obtain a copy of his birth certificate to be certain. 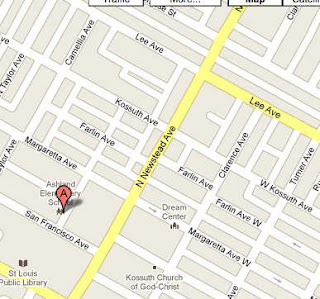 According to GoogleMaps, in some parts, there is a street between Delmar and Enright, in others there isn't. I still need to go through the city directories for most of the 1920s. 3) Also according to city directories, Barney Newmark opened a cleaning business in 1921, so the tailoring business started to decline significantly prior to the Depression. 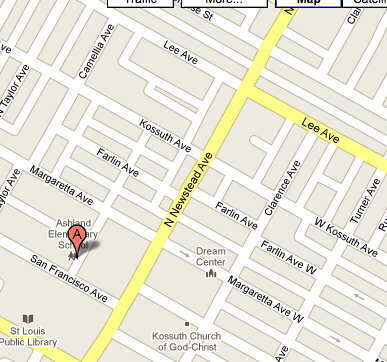 4) Ashland Elementary still exists - at 3921 North Newstead. The number of blocks south from the corner of Newstead and Lee, where my grandfather lived, depends a little on how you count.